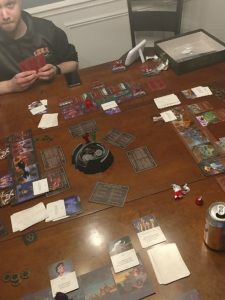 It’s the Sunday before I go back to work after this relaxing break, and I’d like to start up my Sunday education blogs again with a review of a cool board game with, like all games, some education implications. 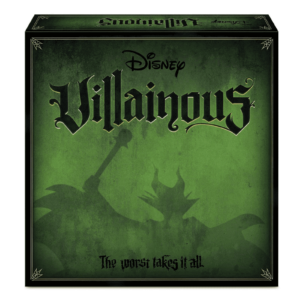 This past year, Wonder Forge Games put out Villainous, a game where players take on the role of a famous Disney villain and work to complete their quest before any other villain. Each villain’s collection of cards and play board are steeped in the lore of the film for which the villains are known. The box comes with six villains: Jafar, Queen of Hearts, Prince John, Ursula, Maleficent, and Captain Hook. I’ve played as three of these villains this weekend, and I’m already excited to see an expansion! The box claims that it is a 50-minute play; the four of us took just over two hours. We are rookies to the game, but with more than two people, this is not a 50-minute game; be ready to put in some time. Even with the long play time, It’s fun. I totally dig it. It feels unique. Original. And with all of the copy-cat games coming out these days, it’s refreshing to play a game that actually feels new. And the familiar Disney scenes, characters, and locations brings an excitement if you are a Disney fan. As you play your villain, you, in effect, are playing the story where that villain lives. Depending on how many players you have, you are watching that many stories play out on the table. And each villain plays differently, so not only is there a good amount of replay value, but it’s cool to watch each player doing different things in their quest to win. And even more fun when you get to toss a hero in their path to slow them down! This game does some things that we should be doing in our classrooms. It offers players (students) options in the way they play the game to get to the objective. It pulls from cultural references that enhances the play (learning). And it includes some interaction between players (students) that is not intrusive to game play but does add layers of intrigue and strategy. Lots of thought and strategy goes into playing this game. The two-hour game we had last night was a mental workout! This game would have a great place on a classroom shelf, but it does take a bit of time to play and if someone is not used to playing card-based strategy games, there will be a learning curve. If you’re a fan of games, get it! It’s available pretty much everywhere board games are sold.